The CIS Fitness Program includes an instructor-led, machine-based circuit training exercise program. The system is taught by staff who have received training in exercise physiology for older adults. The 20-minute circuit targets cardio maintenance and has a social component in the circle-based system. It is comparable to a smaller, less intense version of “Curves.” Machines are set on light tension to give all participants full access. 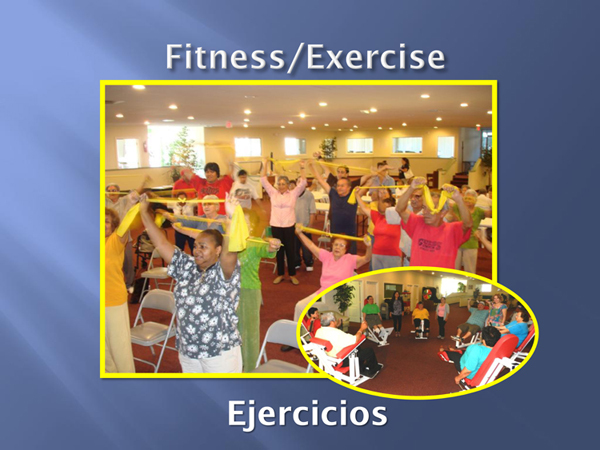 Participants also have the option of instructor-led chair aerobics for one hour each morning. There are hour-long Zumba dance classes 3 days a week. CIS offers a mini-gym area with a treadmill, traditional U-gym, stationary bikes and stretching machine. While CIS is a social model program, we offer therapeutic paraffin hand treatment by appointment 1-2 mornings a week. This treatment is administered by a licensed cosmetologist, and it relieves the pain of arthritis. This no-cost treatment benefit is included in the program and is otherwise valued at $40 per session. Since this target group is often under-motivated and sedimentary, CIS will encourage participants to stay with the program. Exercise may be the only activity that enables them to retain or regain a reasonable quality of life. Each exercise activity is designed to accomplish a wide variety of the participants' goals and will last approximately 20 to 30 minutes. It will focus on individuals with a decreased ability to walk, incontinence, and dementia, and wheelchair users or those using walkers.